Well, the windows are IN! Woot! Flashed, signed, sealed, and delivered. Some 6 months after the storm we are weatherproof! These are high-end, custom, “hurricane” rated, wooden windows and should last a lifetime, barring future hailstorms of course. When 2-3″ hail is propelled by hurricane force winds all bets are off. I’m also pleased to have solved a problem that’s been plaguing this house since it’s construction. 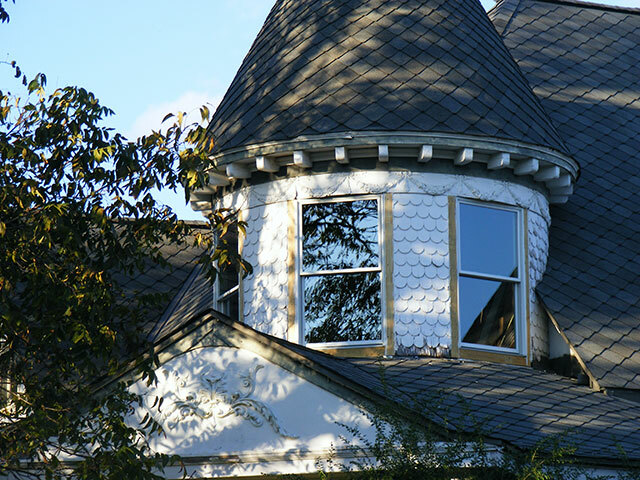 The sills of the old windows were flat and practically flush with the lower roof, providing a source of nearly constant leaks inside the tower walls, and then of course, into the entry parlor (round room) below. Their location and construction pretty much made the leaks inevitable. I shortened the new windows about 5 inches and gave them a proper sill/trim/flashing. These should never leak again. I also maintained the trim width/profile so that it matches the rest of the house (once painted). Removing the remains of the original windows I found the word “Doak” penciled on several of the pieces. This was interesting as the history of the Old Vic says that when built, the family that commissioned it was the Doak family…it was called “The Doak House” for some time…finding evidence that the original frames/trim was milled for the Doaks is cool. Nathaniel P. Doak was the first District Attorney of Red River county. By 1890 he was a 6th District Judge. He was a Freemason with a Royal Arch Degree. Given that Clarksville was the county seat, it was only right that he build a fine mansion there after he married Maggie Burgher, the daughter of Colonel Young Burgher. Of note, his second wife was Laura Reed, his niece, daughter of his first wife’s sister. At the time of his first wife’s death he had two small children at home, and the two wives appeared to be close friends as their names appear together in news articles about charity work in Clarksville. 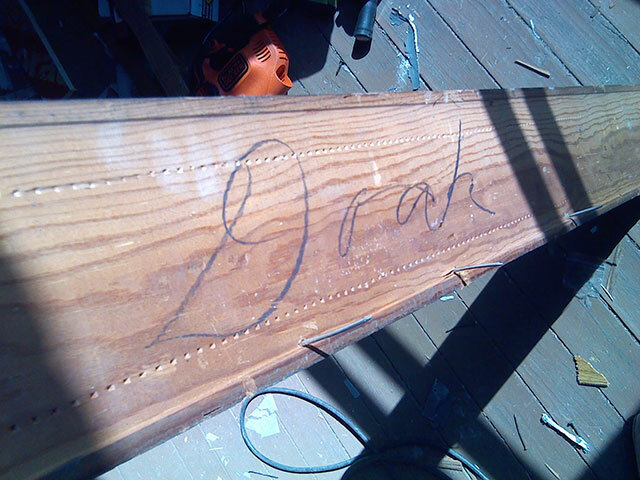 Original trim was custom milled for the “Doak” family. I still need to do the trim work inside, but that will be a little later is it’s only for looks, and more urgent projects are next up (like finishing the front porch!). I will be able to salvage some of the interior trim (most marked “Doak”! ), namely the side trim and header “bulls-eye” trim. The curved top and bottom interior trim had suffered from the constant leaks over the years and I’ll have to replace that. Fortunately, its state of decay gives an intimate look into its fabrication and I’ll be able to replicate it quite easily…okay, not “easily” but yanno…”doable”…and well…fun of course! More pictures to come then. I should note that my insurance company thinks this job…including parts and labor, should have cost all of $110.